Well, March is behind us. 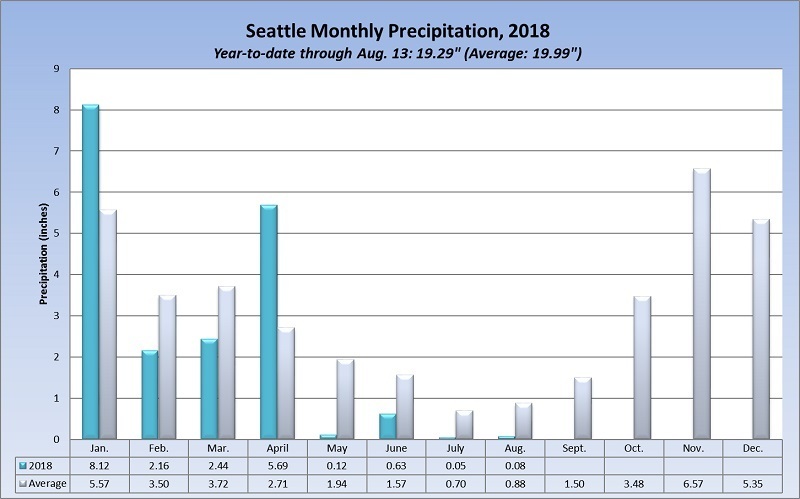 We had only 36% of the normal month of March rainfall, here in the Seattle area: 1.37 in. vs the average of 3.72 in. Cloud cover but still no rain. 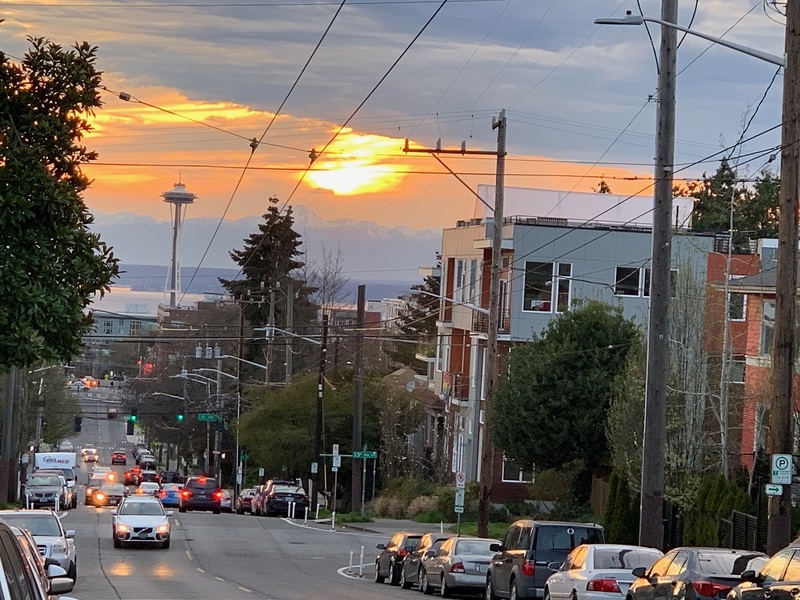 Here’s a late afternoon view looking into the sunset, from where I’m standing at 14th Ave and John. Those are the Olympic Mountains, on the Olympic Peninsula, behind the Space Needle. We finally have some warmer weather on the way, and the weatherman says we should get to 65°F /18°C by Monday. 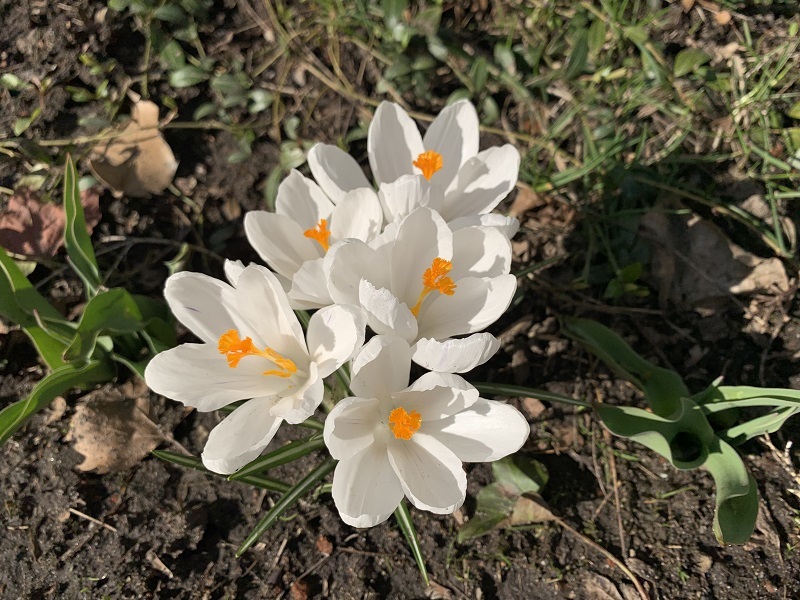 These little snow crocuses (Crocus chrysanthus) are seen around my neighborhood this time of year. 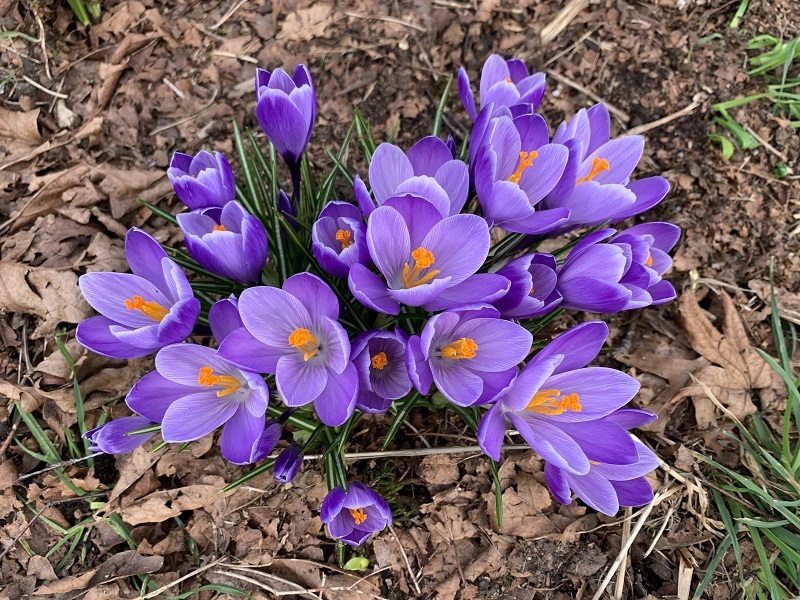 Only 3 to 6 inches tall, they can pop up even when there is still snow on the ground, and are native to the Balkans and Turkey. We had completely blue skies here in Seattle on Sunday and Monday. A superdry air mass is just sitting over the area. With no cloud blanket, it gets really cold at night. A record low of 16° F (−9°C) for Mar 4 was measured in Olympia this morning. 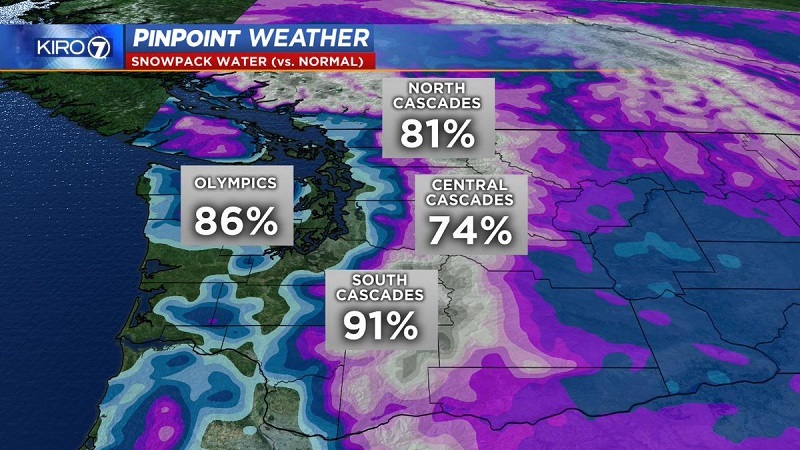 We had LOTS of snow on the ground in the city in February, but the snowpacks in the mountains are actually still lagging below their normal levels (100% would be where it usually is this time of year). [Graphic: Morgan Palmer and KIRO7 news]. Here is Table Mountain, basking under blue skies on a beautiful summer day, seen from the Victoria & Alfred Waterfront in Cape Town. 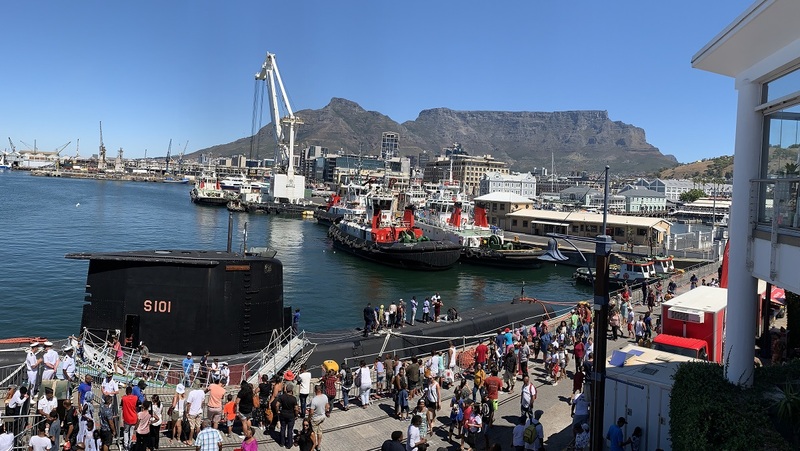 The submarine on display at the V&A Waterfront (as part of Armed Forces Day 2019), is the SAS Manthatisi. She was built in Kiel, Germany, commissioned in 2005, and is named after the female warrior chief of the Batlokwa tribe. Her home port is the naval base in Simon’s Town. 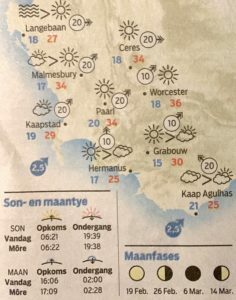 Cape Town highs today: 29 °C/ 84 °F and partly sunny. The days are still long: 13 h 15 mins. [Graphic from ‘Die Burger’]. 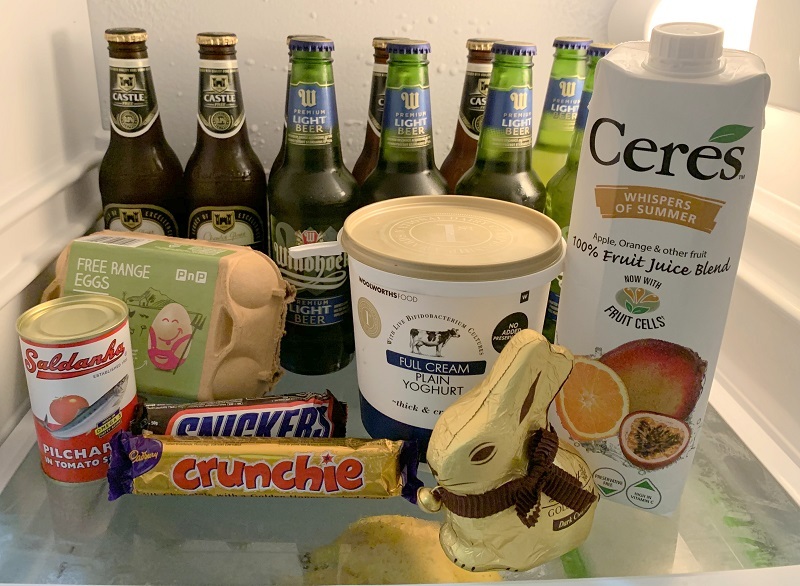 A peek into my refrigerator here in my AirBnB apartment. The canned fish (Saldanha Pilchards) are from the chilly waters of South Africa’s west coast | Castle lager now has a non-alcoholic version | another favorite are the Windhoek Lights (2%), brewed in the German tradition in Namibia | the Crunchie bar has a crisp honeycomb center covered with chocolate | Ceres makes the world’s best fruit juice blends (this one very romantically named ‘Whispers of Summer’) | Woolworths (‘Woolies’) is the place to go for fine foods and yogurt | The Lindt rabbit comes from Switzerland, of course. I had to get it because the dark chocolate ones are hard to come by in the United States! The weather was much cooler today. There were no power outages, and tonight a lucky South African may win the largest local lottery jackpot ever: R 210 million/ US $14 m*. I have beer in my fridge, and some of my favorite South African snackies, so life is good. *A fraction of the obscene amounts offered in United States lotteries – but drawing 5% each year of US$ 14 m comes to $700,000. Plenty to live a lavish life, anywhere in the world. 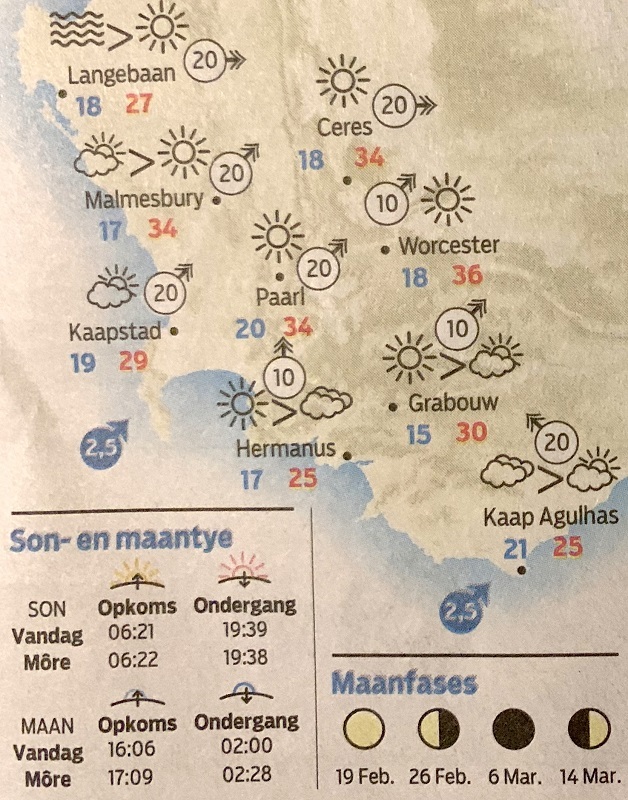 It was a scorcher here today in the northern suburbs of Cape Town. My little rental car’s dashboard gauge hit 39.5°C/ 103°F at one point! There is no water supply crisis in Cape Town the way there was just a year ago (dam levels at 57% vs 25% a year ago). Even so: I try to use water sparingly. As someone said: the best time to save money, electricity, water, is when you still have plenty. P.S. 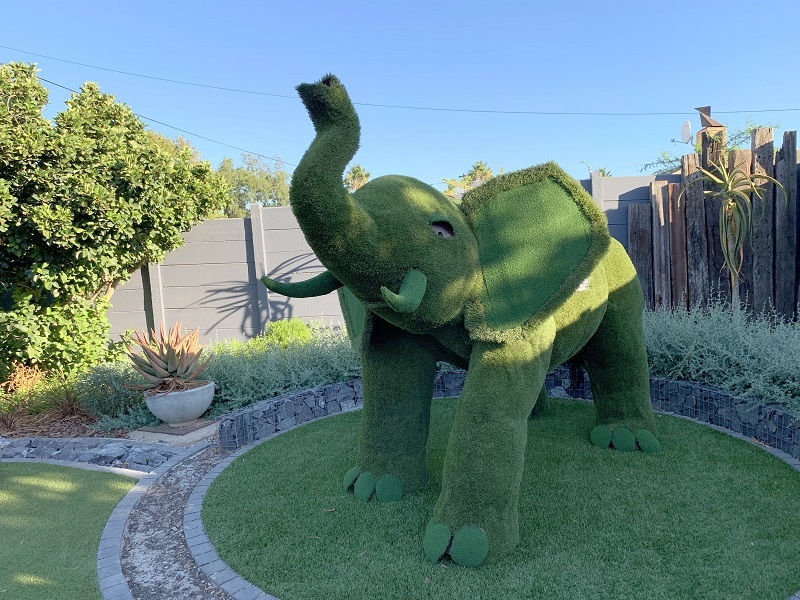 Check out the cool safari animals that I found today on Eversdal Road in Durbanville. 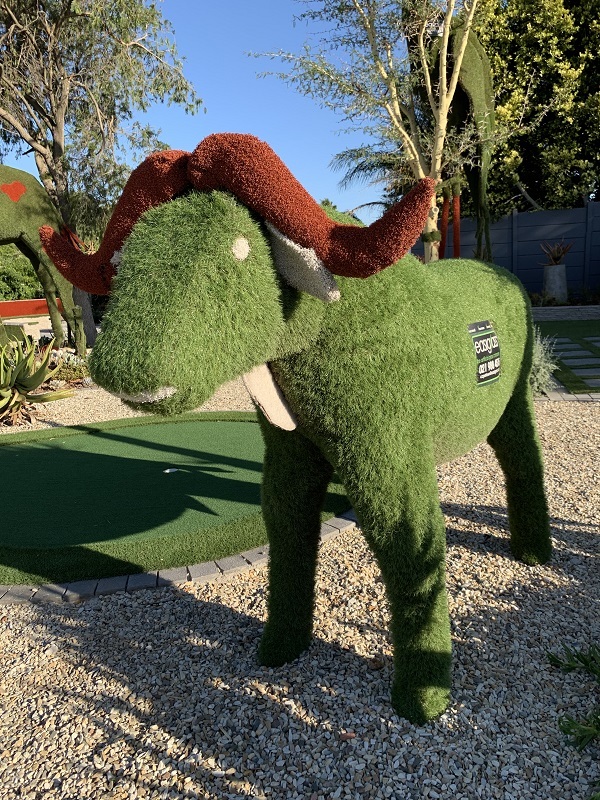 They advertise artificial turf. 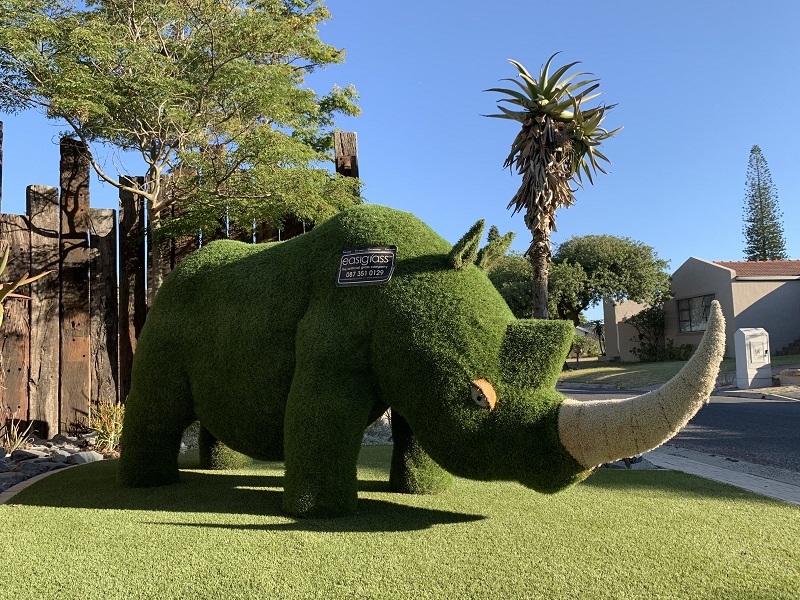 I think the rhinoceros will make quite a statement, if I were to install one in my front yard in Seattle! 15 cm = 6 inches. 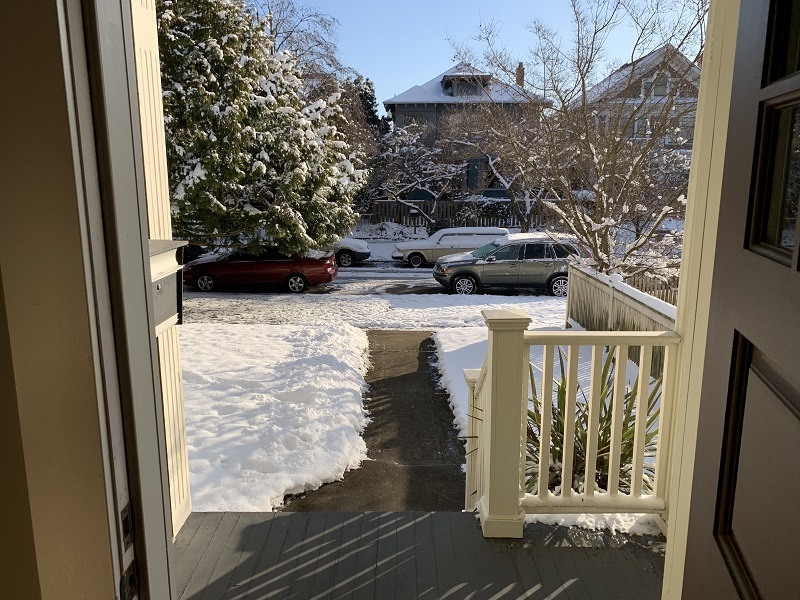 Whoah .. lots of white when I opened my front door this morning! I can still make out the walkway to my front door, though .. so I know where to shovel the snow away. Here’s an American robin (Turdus migratorius) with its striking orange breast. I found a whole bunch of them, feasting on the red berries on a bush by the sidewalk, here on 15th Ave. 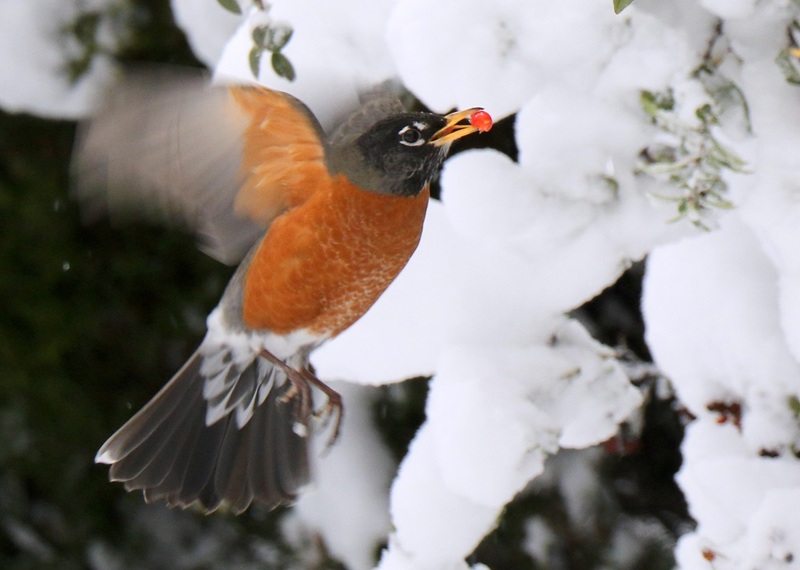 These robins are often among the first songbirds singing as dawn rises (or hours before), and last as evening sets in. Well, we are at 6 inches here in the city, says my unofficial snow meter (the railing alongside the deck at the back of the house). It is great to be in a warm and cosy house, and to be able to just watch the local TV station’s coverage of the conditions outside, and of the streets. I did venture out on foot mid-morning, to take the obligatory few pictures of the snowy street corners in my neighborhood. We had another round of snow this afternoon (almost 3 inches), with more expected overnight. Then there will be a break on Sunday, before the snowfalls resume on Sunday night. That’s good news for my travel plans, since I have a flight to South Africa* scheduled for Sunday! I hope I will get to the airport and get out OK.
*With a stop and an overnight stay in Amsterdam. A fresh white blanket on the ground and on the trees and rooftops: about 3 inches of snow by nightfall. 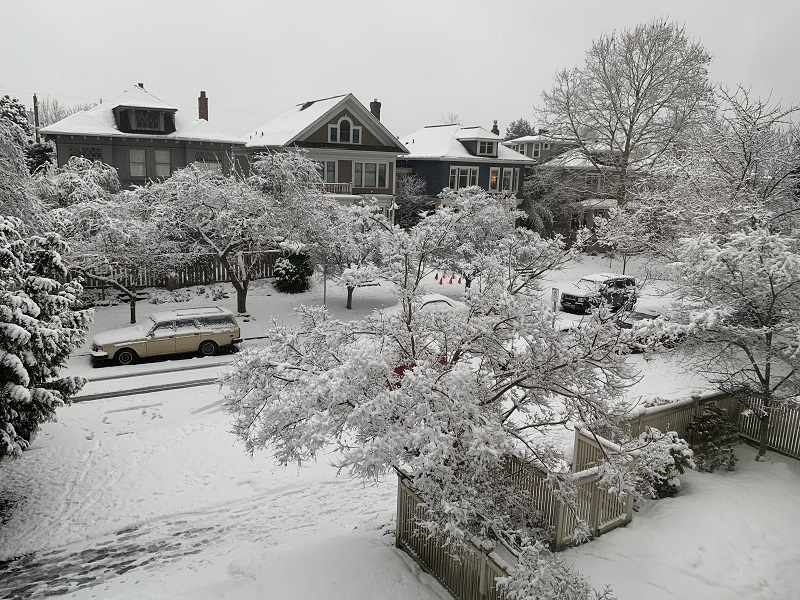 I know it’s not much by East Coast & Midwest standards, but 6 inches of snow in one go is a lot for Seattle. So let’s say there is 6 inches by Sunday. Weather models show there might very well be another 6 in. coming down on Mon & Tue, for a total of 12 inches in the city. Yikes. That’s why there were reports of stampedes for foodstuffs (milk & bread) at grocery stores, and for rock salt at hardware stores, on Friday morning. The sun was out, with clear blue skies on Tuesday. We got above freezing by a few degrees: enough to start melting the snow. There is another system on the way that will bring more snow on Friday, though! The view out my front door this morning. Yes, the walkway does not clear itself: I had to get in there and shovel the snow out of the way. (Not that I receive a parade of visitors every day, but hey, at least now the mailman can make it to the mailbox by the front door). Monday/ snow day .. brrr! The snow kept sifting down through Sunday night, and by noon today, there was 4 inches of snow on the ground at my house. 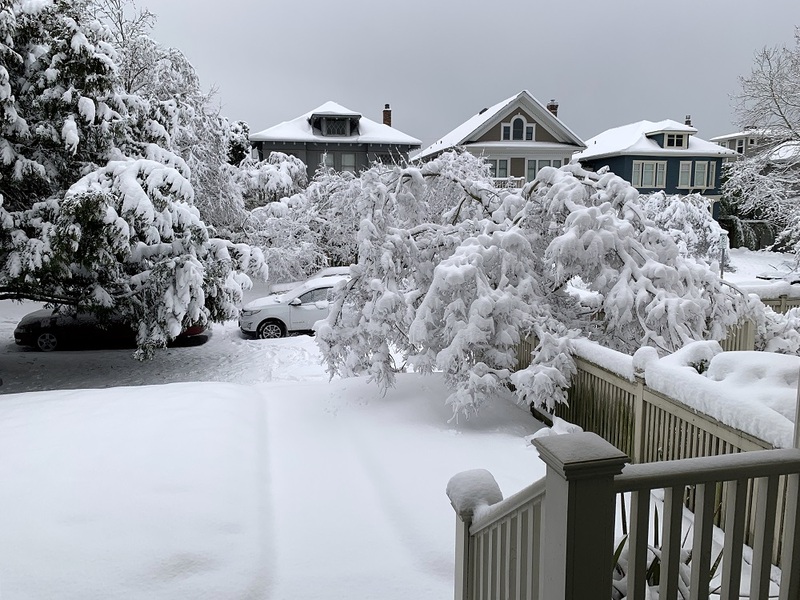 North of the city, some places recorded 12 or 13 inches of snow. It was cold today! Even the day temperatures only got to 29 °F/ -2°C. As usual, I felt compelled to run out early in this morning to take a few pictures of the snow. 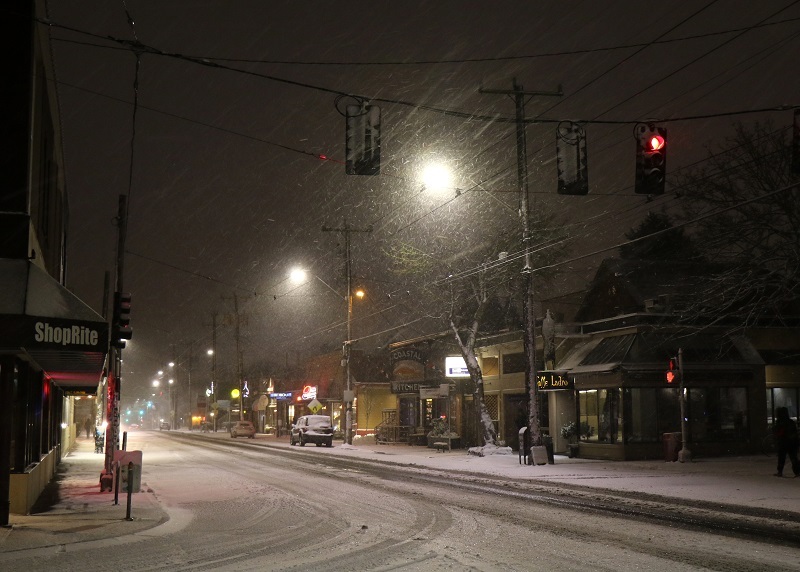 This is 6 am, looking north, while standing on the corner of Roy and 16th Avenue. 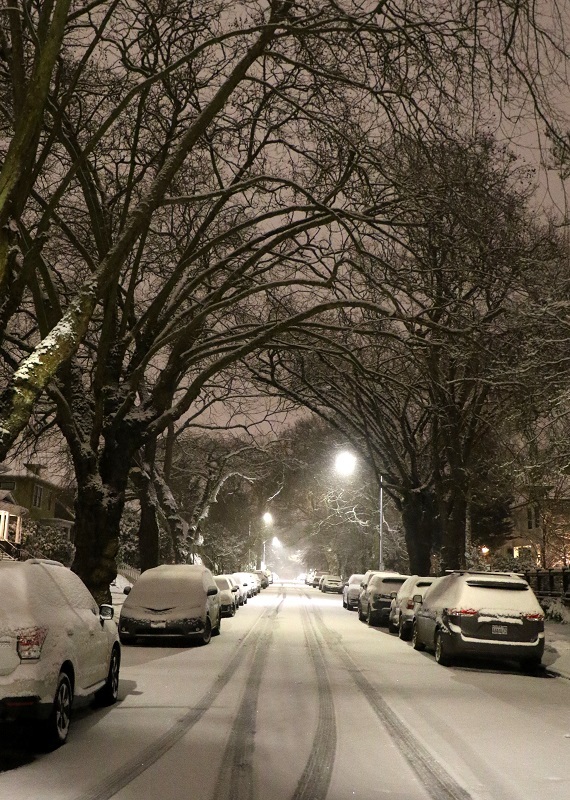 Here’s the early morning scene on 15th Avenue, with the snowflakes showing in the halo of the street light. 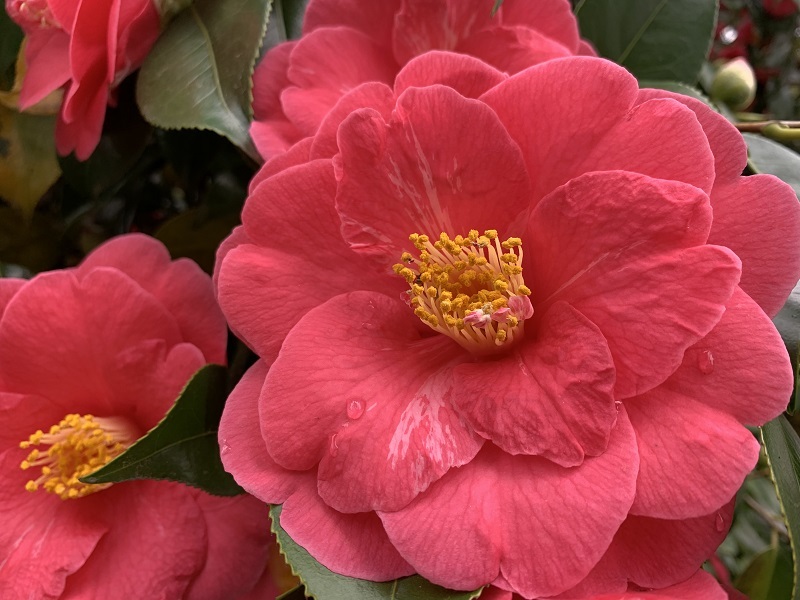 It’s February of 2019, and the cold in the Midwest is easing. We’re about to get a spell of cold weather on Sunday and into Monday here in Seattle. We might even see snow on the ground in the city. It’s a good time of year to be a creature with a floofy, fluffy coat! I found this cute picture on Twitter but did not make a note of the original source. The pups are Samoyeds: is a breed of large herding dog, from the spitz group, with a thick, white, double-layer coat. 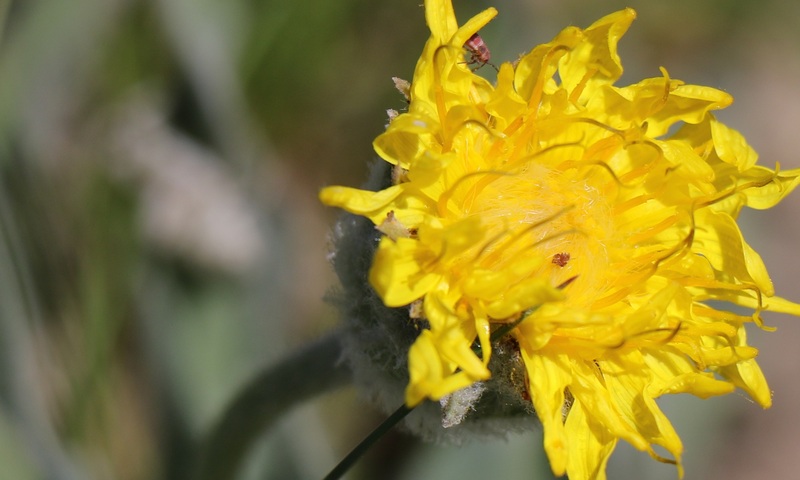 It takes its name from the Samoyedic peoples of Siberia. [From Wikipedia]. P.S. 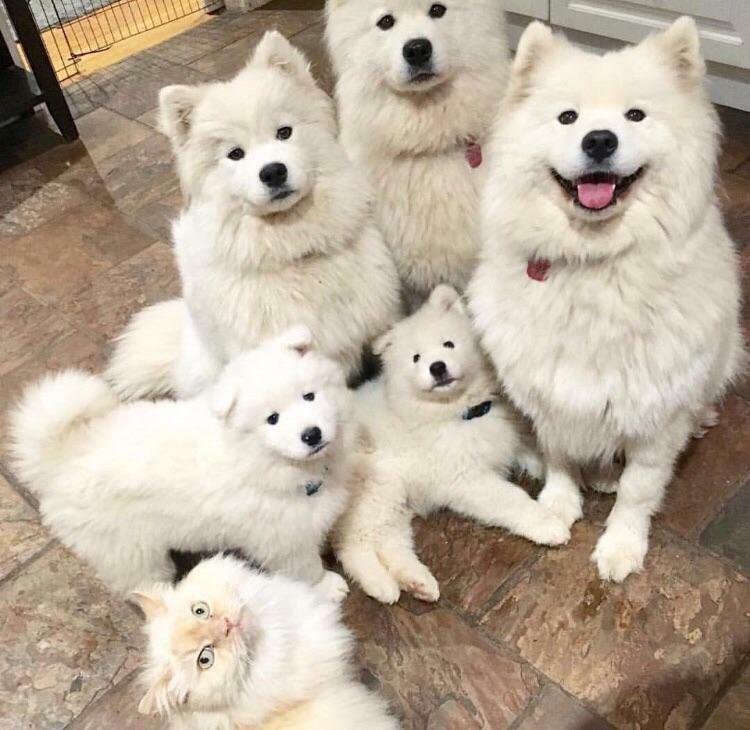 Was the fluffy cat supposed to be in the picture, or is it photobombing the picture? 🙂 And I don’t know what breed of cat it is. The polar vortex is pushing down into the Midwest of the continental United States, and will bring the frigidest temperatures in 20 years, to many locations. Meteorologists had to debunk Trump’s idiotic tweet from Monday, in which he ‘called’ on global warming to ‘Please come back fast, we need you’. 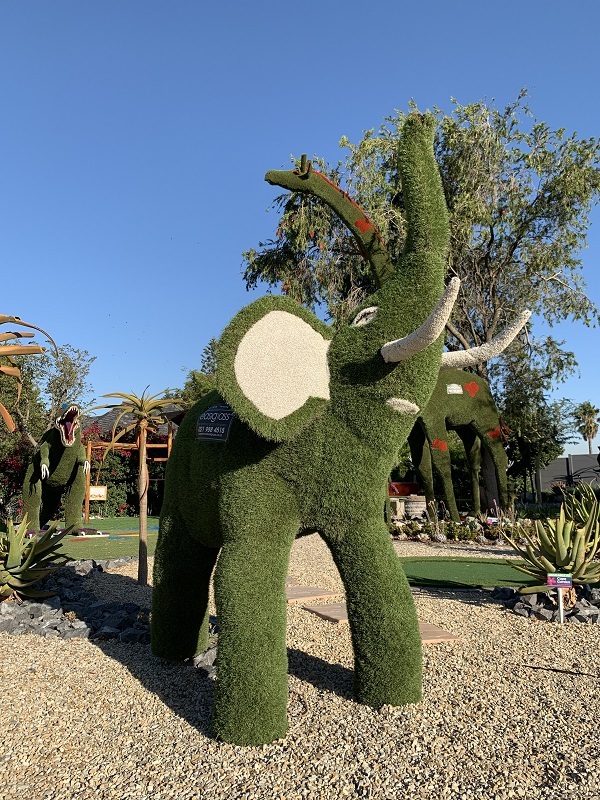 As NASA explains in a Climate for Kids video, weather is only temporary, while climate describes the typical weather conditions in an entire region for a very long time – 30 years or more. 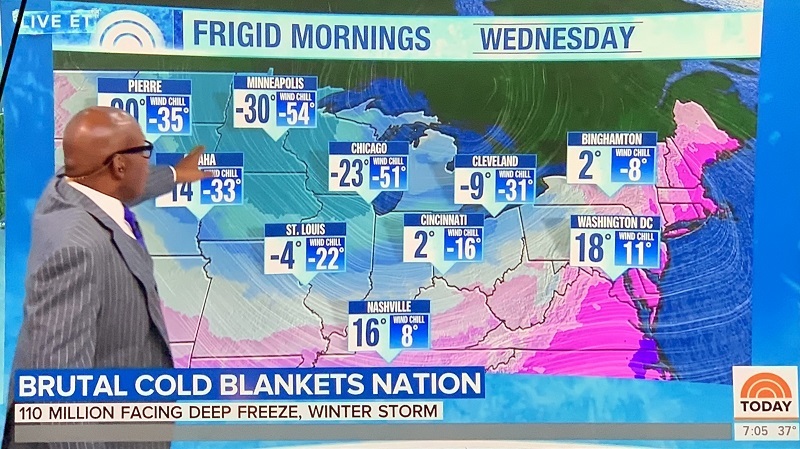 Weatherman Al Roker pointing out the frigid temperatures and the wind chill values expected for Wednesday in several major cities in the Midwest. [Source: NBC’s Today Show]. Sigh* .. at least Trump visited California (on Saturday), and saw the devastation firsthand. He seemed to get along swimmingly with the new Governor-elect of California, Gavin Newsom. This after he had been pretty rude to him in Tweets in the past. (Gossip: Could it be because Newsom’s ex-wife Kimberly Guilfoyle now dates Trump’s oldest son, Donald Trump Jr.?). 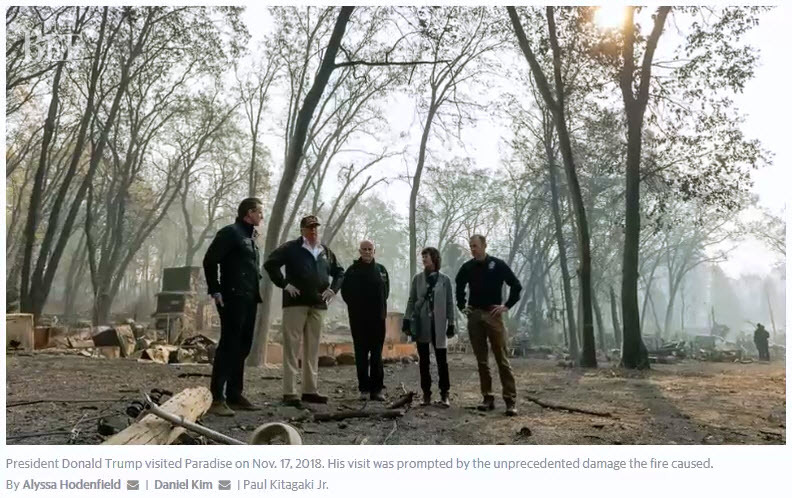 *Trump felt the need to repeat his ‘assessment’ of California’s forest management: ‘In Finland they rake the forest floors’. (This baffles the Finns, and prompted a denial from the Finnish president that he had ever told Trump that). Then Trump got the devastated town’s name wrong, calling Paradise ‘Pleasure’, instead. When he did it a second time, FEMA administrator Brock Long (and Governor Jerry Brown) could no longer stand it and corrected him loudly. From left to right Gavin Newsom, new Governor-elect of California, Trump, Jerry Brown, California Governor, Paradise Mayor Jody Jones, and Brock Long, administrator of the Federal Emergency Management Agency (FEMA). [Picture from Sacramento Bee]. Cape Town’s dam levels hit the 70% mark on Monday for the first time since 2015. 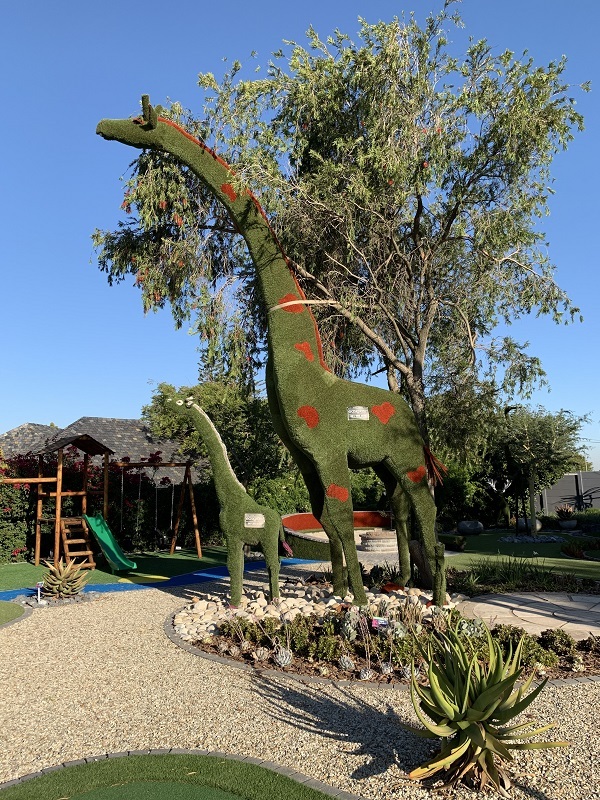 The severe water restrictions that had been in place, have been relaxed, albeit just by a little*. The rainy season is coming to an end in September, and a long dry summer lies ahead. *The City is asking residents to use no more than 70 liters (18.5 US gal) per person per day, up from a 50-liter (13 US gal) limit. 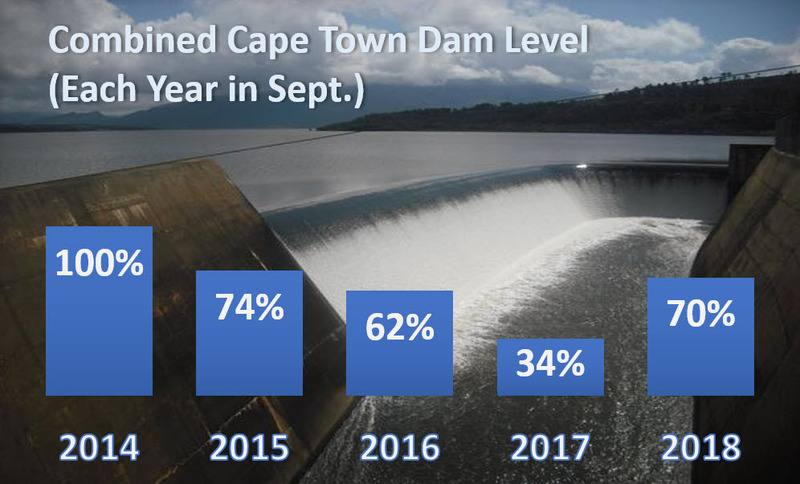 Cape Town metro area dam levels the last 5 years, in September. The picture is of the Theewaterskloof Dam, gloriously at full capacity in Sept. 2014. It is currently 52% full, up from barely 12% before the 2018 winter rains had come. [Picture credit: Twitter post from Cirrus@OrionnebulaAE]. The areas south of New Bern and Wilmington have recorded 30 inches of rain, and the rain is still pouring down. Not surprisingly, many roads and streets are flooded, and there are widespread power outages as well. Map and report from the Sunday edition of the Washington Post. Thu 11.00 pm EDT: Florence has not made landfall yet (50 miles from the coast) .. now a Category 2, so the storm’s wind speeds have come down, but there will still be a lot of water to deal with*. Up to a third of the people in some communities have elected to stay put, in spite of the evacuation order. Time will tell if that was wise. (Some people had no place to go, or no means to evacuate, though). *4.9 million people live in areas that will get more than 10 inches of rain over the next 5 days. 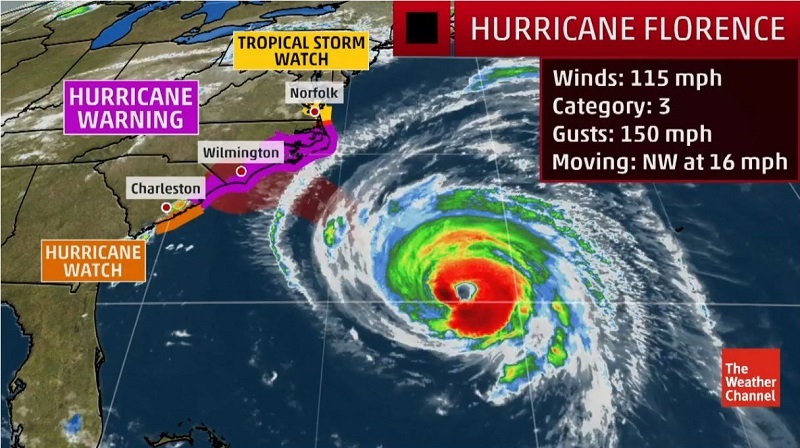 Fri 11.00 pm EDT: Florence made landfall near Wrightsville Beach, North Carolina at 7:15 AM EDT on Friday. By late afternoon, several hundred people had been rescued, and 5 deaths directly related to the storm, had been reported. Many of the streams and rivers in the storm’s footprint are expected to crest at record levels downstream. Here’s Gadi Schwartz from NBC enduring the rain and wind. Does it make a mockery of telling everyone to bail out, and then the storm-chasers and news crews go right into the storm? Well, Gadi explains in a ‘safety explanation for mom’ video on Twitter that they do a lot of preparation when picking locations to report from. The crew watches for flying objects, and in this case they have a concrete building with 5 floors, right behind them, to retreat into, for when push comes to shove. [Screenshot from MSNBC]. 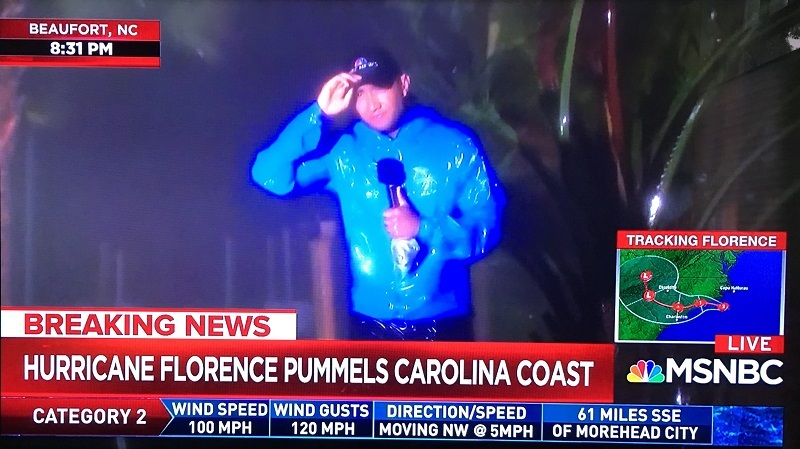 We’re all on Florence watch here, even the West coasters. (Hurricanes do not hit the West Coast, due to the direction of global winds, and the Pacific Ocean’s water temperature). 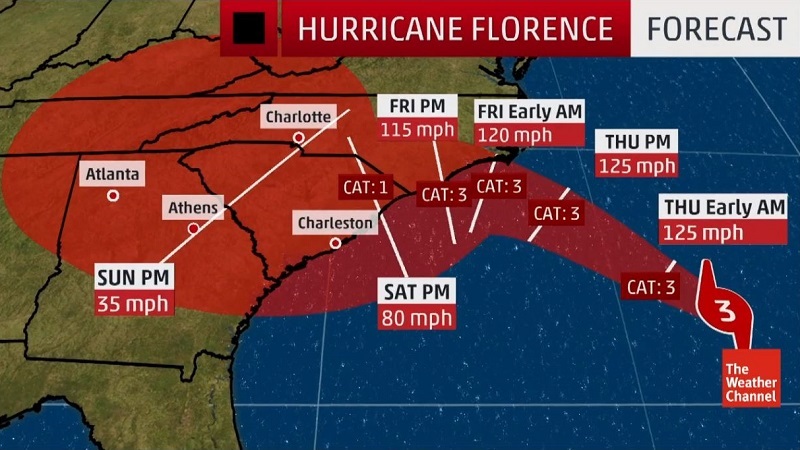 Hurricane Florence is bearing down on North Carolina. The latest models show that it might rake the coastline after coming close to the mainland, resulting in a 9-13 ft storm surge from the ocean. This, combined with upwards of 30 inches of rain in some areas will make for wide-spread flooding of low-lying areas. Some of the long narrow barrier islands off the coast will be run over completely with seawater. About 1 million people along the coast are under mandatory evacuation orders. The monster is approaching. At this point, there is very little chance that the storm will turn and not make landfall (late Thursday night or early Friday morning). 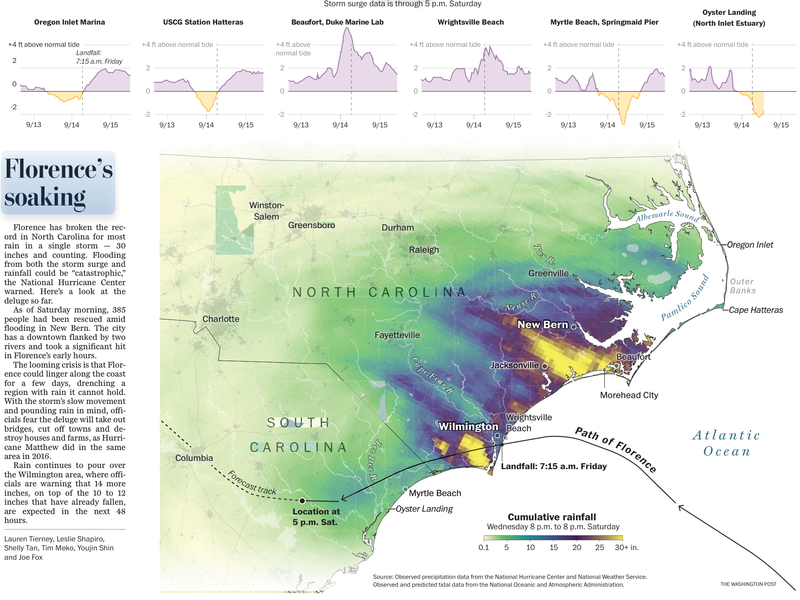 Florence was a Category 4, but has been downgraded to Category 3. 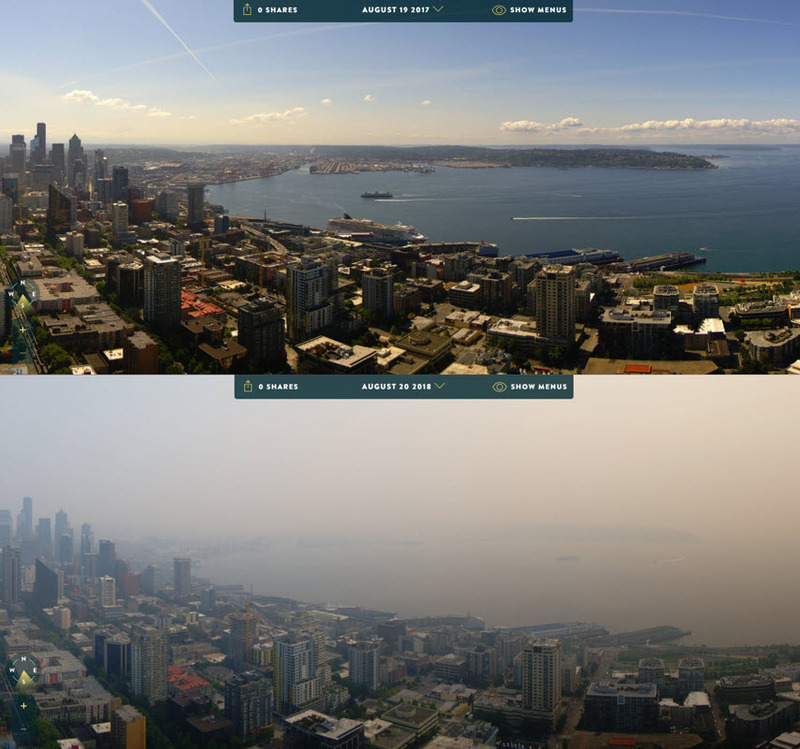 The smoky, unhealthy air that had blanketed the city since Sunday night, finally cleared up today. There was a sprinkle of rain this morning, but I watered the garden later on in the day, as well. 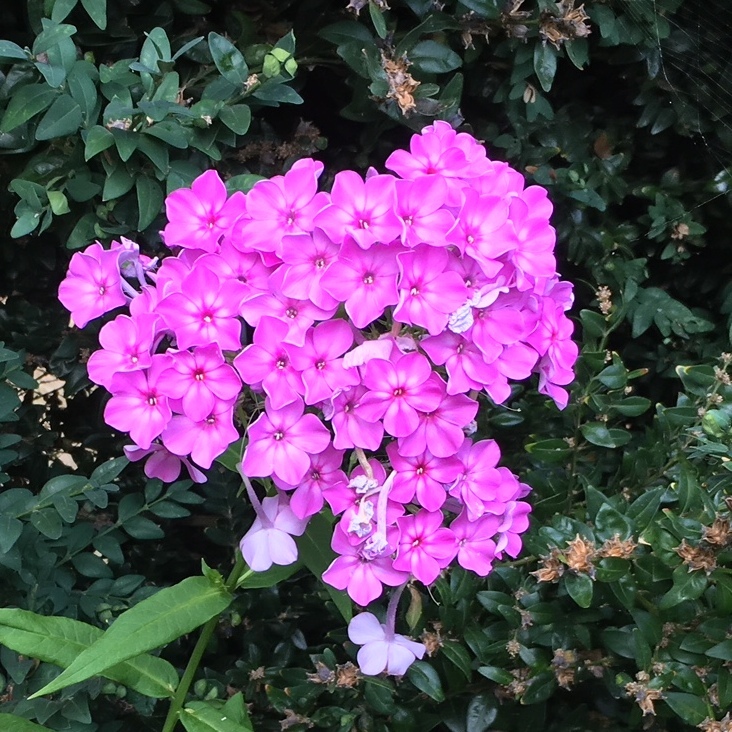 The garden phlox with its pretty-in-pink flowers from my front yard is still in full bloom as summer is winding down. The air quality for today (and expected for tomorrow), for the Puget Sound region, is pretty much the worst on record*. Winds from the north and from the east have carried vast plumes of smoke and PM2.5 particles from the raging wildfires in Canada and Eastern Washington, to the region. *An air quality value of 218 is reported tonight in my neck of the woods, which is in the ‘Very Unhealthy’ category. 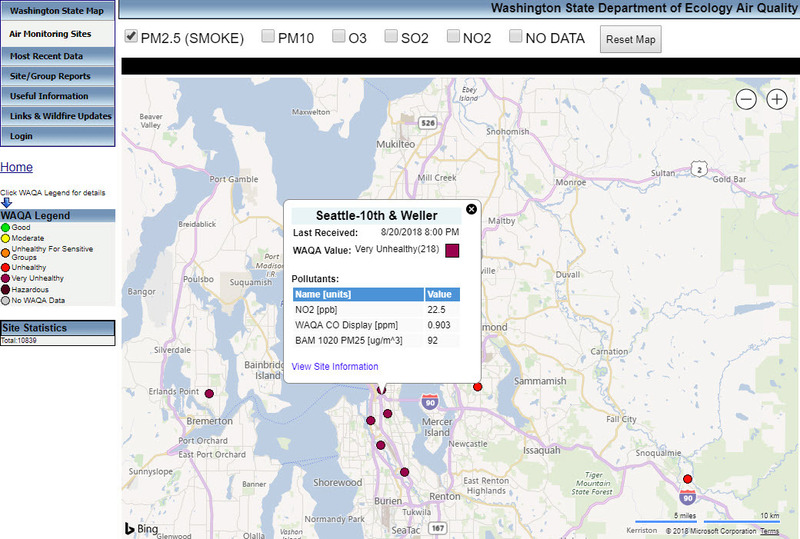 [Source: https://fortress.wa.gov/ecy/enviwa] The Washington Air Quality Advisory (WAQA) value, is a scale that is a little stricter than the national Air Quality Index (AQI). A reading of 218 means stay indoors, keep windows & doors closed, and do only light indoor activities. Yikes. The air should start to clear by Wednesday night, say the weather people. From the Space Needle Cam. Top: August 19, 2017 was a clear blue sky day. The Mountain is out (Mt Rainier is faintly visible). Bottom: Today looked like a scene out of Mad Max Thunderdome or Blade Runner. The future has arrived, and it is ugly.